In the 87 years of Coxmoor Golf Club's existance. many things have changed. The course bears little resemblance to that on which the first balls were struck back in 1914, and over the decades, members have come and gone, captains change with every passing year and the roll call of club secretaries runs into double figures. It is what anyone would expect of such thriving organisation - but how many clubs anywhere UK can boast a record of only three professionals over a period of 87 years ... and two of them from the same family. In those early pioneering days when the outline of the club was still being shaped. the members struggled along without the guidance of a paid expert to coach them in the finer points of the game, repair their clubs and teach them the rules and etiquette expected. But in 1924, Coxmoor began an association with the White family from Bulwell which would survive, unbroken, for more than 60 years and leave an indelible mark on the club's history. 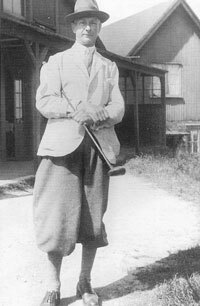 Len White, who was born in Bulwell in 1887, began his golfing career as the assistant professional at Bulwell Forest before joining legendary pro Tom Williamson at Hollinwell in 1902.
the New World in search of his fortune. He made his home in Edmonton, Alberta, and between the years 1910 and 1911, he was responsible for the construction of the Canadian city's golf course. But in those far off days, there was not enough money to be made in golf so Len turned his hand to farming. That did not work too well either, especially when a raging thunderstorm washed away most of his land and crops. Tom decided to return to England and his chosen profession, taking positions at golf clubs in The Wirral and Hornsea. Then Tom got another call - but this time it was to join the First World War effort. Tom's skills as a golf coach stood him in good stead because the Army used him as a weapons instructor. He left behind his Sandiacre-born wife Sarah to run the golf club while he went off and did his bit for King and country. Fortunately, Tom came home from the war to end all wars unscathed and was able to resume his golfing duties at Hornsea. But the ex-Bulwell lad was still not settled and once again he turned to farming, this time in Warwickshire. Len was clearly having problems establishing a settled life as he moved between golf and farming, on both sides of the Atlantic, and perhaps, when he arrived at Coxmoor in 1923, he saw the club as just another step along the road of life. And the early signs were not particularly auspicious. When he arrived at Coxmoor, he discovered there was no living accommodation within the clubhouse. For a married couple with a young family, it was hardly the ideal situation, but Len clearly saw something in the job that appealed to him. He left his family behind in Warwickshire and took lodgings at Red House Farm. The club's officers quickly realised that the situation had to be resolved if they were to retain Len's services. They built two bedrooms above a new ladies room as living quarters. This meant the ladies had to go from the main entrance along a path and down some steps to reach the ladies room. But, after a year, it was ready for occupation and Len was able to bring his wife Sarah, and their two children, ten year-old son Bill and daughter Joyce, aged three, to their new home at Coxmoor. Bill had visited Coxmoor with his father earlier, riding in the dickie seat of a red two-seater Salmson car, to take a look. They moved in 1924, arriving from Warwickshire in a furniture van. Bill can remember being warned not to fall off as they made their way around the water tower to get to the clubhouse. he could and on looking after the course. There was more than enough work to keep Len, and Sarah busy. With the golf course barely ten years old, there was much to do to keep it in good playing condition and as for the equipment, those old Hickory shafted clubs were always in need of repair and replacement. In fact, steel shafted clubs did not become generally available until 1929. At his side, when he was not doing his schooling at Station Road and Hardwick Street, was his son Bill. Looking back, Bill's future was mapped out for him almost from the day he was born. It was just always there for me and, fortunately, I took to it,' Bill says. Len taught his eager son all he knew about the game and before long, Bill had left school to join him more or less full time at Coxmoor. Then, in 1931, he left his father and became assistant to Hollinwell professional Tom Williamson. Tall and willowy, he developed into a long, straight-hitter, particularly when he had an iron in his hands. He entered competitions whenever and wherever he could, and with a fair degree of success. 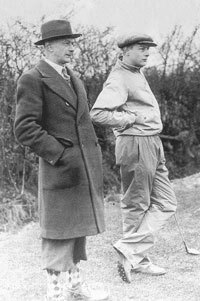 In 1939, the British Assistants Championship was played around Hollinwell and Bill used his course knowledge, allied to a skilful game, to take the title. In fact, 1939 was a good year for Bill. He finished the eighth highest money winner in Britain - his total prize money for a season of success was £200. He remembers winning £50 for coming fourth in an Irish tournament around that time and also recalls the day he travelled to a tournament on his motorbike, with his bag and clubs across his shoulders. Comparisons with the style and luxury today's golfers enjoy are unworthy. It was a different era, different standards, different expectations - but there is no reason to suppose Bill White would not have fared equally as well, if not better, against today's exciting generation of professionals. Bill's performances took him to the fringes of the Ryder Cup team - a much-coveted honour even in those days when Great Britain and Ireland always lost to the USA. But at a crucial time in his tournament career World War Two intervened. At the outbreak of the war, his father Len joined the local Home Guard, and in those early, dark days as Hitler rampaged through Europe and appeared ready to invade, Len did everything he could to make sure his family would be safe, should paratroopers suddenly drop out of the sky and onto Coxmoor's fairways. He had an air raid shelter built near the workmen's hut and he also took other precautions to safeguard his valuables. Bill takes up the story: "He put all his documents in a 71b biscuit tin and buried it in the bunker on the left hand side of the 13th fairway. "He told me 'if I am killed, you know where the papers are buried'. As events unfolded of course, Herr Hitler chose not to invade Britain and Coxmoor was spared the ignominy of having jackboots marching up the clubhouse drive. After VE Day, Len was able to burrow down into that bunker, retrieve his documents and get on with the rest of his life. Sadly, Len would not have too many years left. Running a golf club in all its many aspects, was a hard life and over the years the varying demands, mainly physical, had taken their toll. There were no motor mowers to cut the greens and as far back as the 1920s, Bill can recall the trouble that had to be taken to mow the fairways. Len would borrow a horse from Red House Farm to haul the mowing equipment, making sure to slip on leather shoes over the horse's hooves to protect the surface. The height of mechanised machinery during Len's days was an old Model T Ford tractor which had to be crank started. Anyone who can remember having to get the starting handle out to their cars in those days can easily picture Len putting his shoulder into the job, straining to turn the heavy old engine. One morning, in 1943, the exertions found a weakness in Len's chest, tearing his aorta. `There were no heart by-pass operations in those days,' said Bill. "They gave him tablets to coat the inside of the veins to stop the loss of blood through the tear." That caused Len to scale down his duties and just after the end of the Second World War he handed on the greenkeeping side of the job to concentrate on the physically less demanding role of club professional. `They all thought it was a nice way for him to go' said his son Bill. Len White was 62 when he died. His wife Sarah died on April 1, 1956.